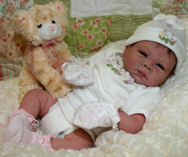 Avery is made of soft newborn pink vinyl. The kit consist of Vinyl head,3/4 vinyl arms,and full legs. Also includes vinyl plugs and innovative neck ring. Avery will make a 20" baby depending on the size body used. 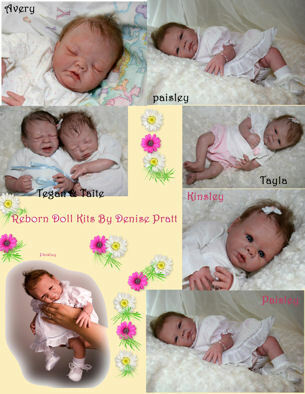 Kinsley is made of soft newborn pink vinyl. The kit consist of Vinyl head,3/4 vinyl arms,and full legs. Kinsey's head measures 13 1/4 inches in circumference. 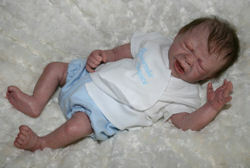 Taite is made of soft newborn pink vinyl. 16 inches long, includes vinyl head, full vinyl legs, and 3/4 length vinyl arms. Also includes a complete set of 5 vinyl plugs, and our innovative neck ring. Taite's head circumference is 11 inches. 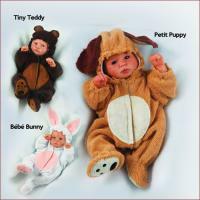 Please use the check box below to purchase Taite who is 1 of the triplets and accessories. Tegan is made of soft newborn pink vinyl. 16 inches long, includes vinyl head, full vinyl legs, and 3/4 length vinyl arms. Also includes a complete set of 5 vinyl plugs, and our innovative neck ring. Tegan's head circumference is 11 inches. 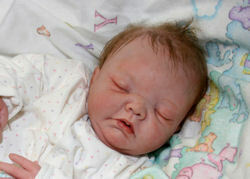 Tayla Is made of soft newborn pink vinyl. 16 inches long, includes vinyl head, full vinyl legs, and 3/4 length vinyl arms. Also includes a complete set of 5 vinyl plugs, and our innovative neck ring. Tayla's head circumference is 10 3/4 inches. Please use check box to purchase Tayla and her accessories. Pasley Is made of soft newborn pink vinyl. 20 inches long, includes vinyl head, full length vinyl legs, and 3/4 length vinyl arms. Also includes a complete set of 5 vinyl plugs, and our innovative neck ring. Paisley's head measures 13 inches in circumference.